My name is Kim Stirling and I live in Vancouver, B.C. on the stunning West Coast of Canada. I’ve been blogging now for over 2 years, starting with the delightful practice of leaving notes to my neighbour on her front door and evolving into a WordPress blogger who often finds herself writing at the edges of our beautiful urban forest and sparkling city of glass where there is always time to linger over a delicious hot chocolate, breathe in the sea air or take a wander! Congratulations Kim! I am really looking forward to read more of your adventures. Your followers and myself will be delighted to pass some magical time with you. 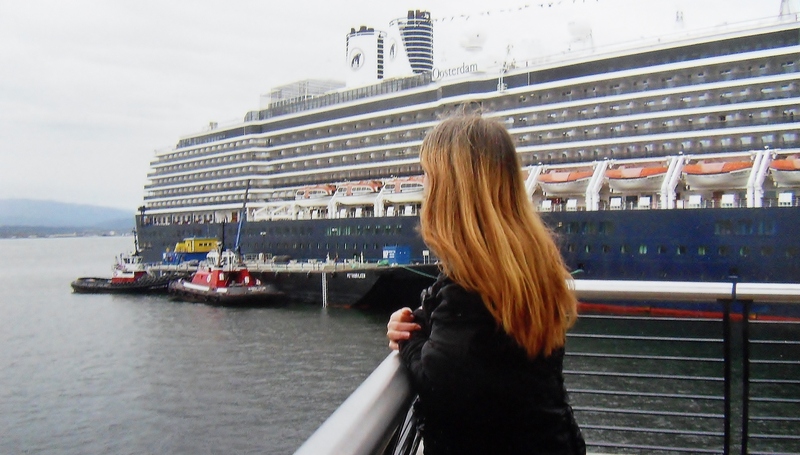 Thank you for capturing a quiet moment-it was fun to head down to Coal Harbour to try to wave goodbye to my father as his ship got ready to sail to Hawaii! We never saw him but our thoughts were with him on that cloudy day in early Spring 2012. Looking forward to starting reading. You’re right, there is always something to write about. No matter how informative or even daft! Hey, somehow I missed your very nice comment, sorry about that – I hope my small note finds you well! this is a wonderful about me and a much wonderful reason to blog. I agree there is always something to write about and you just need to make time for it daily. Thank you for your very nice comment! I am always writing and hope that my blog becomes a window into my small corner of the world for any readers that find me! Hey there, Kimberlee! Since June is the 6th month of the year, I’m following 6 fun and interesting blogs each day, and you’re one of them! Follow me back if you like at http://www.thatssojacob.wordpress.com and make six new blog friends of your own. Have a great day! Thank you so much for reaching out in such a fun way, I really appreciate it and look forward to checking out your blog as well! Hey there! I’m really happy I came across your blog because your content is really really great! Such an interesting take on blogging. Will do and thank you again, comments and like’s are the lifeblood for those of us who write! You got my attention just with your neighbor’s name. what a fascinating name. Thank you so much! She will be thrilled to read your comment and thank you for the “follow”, I’m going to follow you right back! Hey, thank you so much for your very kind words and I’ll stop by soon to have a look at your blog. I appreciate you dropping in and having a read or two! No problem, Rachel! It’s pronounced Hue-get, I hope this is helpful! Hi, Natalie! I must apologize, I somehow missed this – I won’t be able to participate at this time, I’m heading back east on holiday and will be off-grid somewhat. I do appreciate you thinking of me and hope this note finds you well! Not a problem 🙂 Enjoy your holiday!! Thank you for dropping by and leaving a comment, I really appreciate it! Thank you so much, I appreciate your very nice comment! Thank you for coming over to visit my blog. I look forward to following your journey. My pleasure and thank you for stopping by as well! Hi, Paul! Thank you for stopping by and leaving such a lovely comment, I’m so glad you enjoyed your visit. I’ll pop by and have a peek at your site soon! Thanks for coming over to my blog through Nikki’s party Kimberlee. That was a nice intro. Looking forward to reading more of your blogs. Thank you so much for popping by, I appreciate it! I really enjoy participating in Meet & Greets and Nikki’s are always fun! This is my first time at Nikki’s and I enjoyed it too .. I liked your idea of keeping sharing your experience with others. Your plan is helpful in this world! Thank you for stopping by & commenting, I appreciate your very kind words! You’re welcome. Your comment made me happy! Thank you so much for stopping by and leaving such a lovely comment, Debbie – your kindness and sense of fun shines through and through! Thank you for stopping by…I love the energy both you & Trina have…I plan to pop by soon to say a proper “hello”, cheers! What a charming “About” page! Thank you so much for stopping by, it warms my heart! An interesting about page, Kim, a delightful and insight introduction. I’m pleased you found my site, I’m going to enjoy following your writings on your blog.